Now imagine a badly placed cigarette… FIRE! 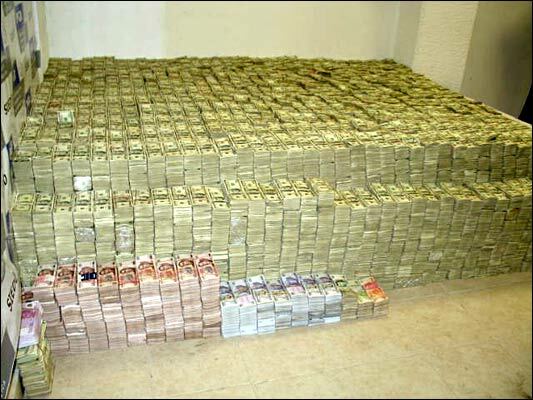 Money Bed!!! May feel like crap, but it is a Money Bed! I always wondered why that stuff was so expensive. “Crime doesn’t pay” my arse! Is that some George Jung investment fund? The question in this case is: Would you have to use all of your life to spend it? Answer: yes = sign me in. How much do you think that is worth? I’m thinking about 1.5b. You? Man that’s a lot of dough! If every bill is a $100 bill, there’s probably $180-$185 million in that picture. This stack is 34 rows wide and about 15 rows deep not including the short row, and each individual stack has about 500 G’s in it. If you count the front row and the other currency, that comes out to about $180-$185 million. That’s not $185 million, the DEA says it’s $205 million. Instead of 15 rows deep, I guess it’s 16 rows deep plus the short stacks, euros, and pesos.